Broncos Safety, Ward Just Opened That Can of Whoop A** | "IT'S A STEELERS WORLD"! The worst thing that any player could ever do is give another player and/or team bulletin board material. 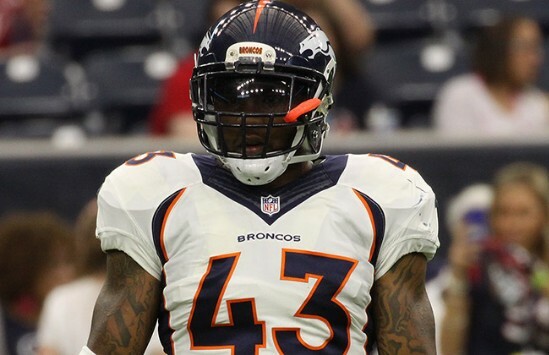 Denver Broncos safety, T.J. Ward has done just that regarding the Pittsburgh Steelers. “They’re hot because they haven’t played us yet,” Ward said. “A lot of teams were hot before they played us”. Really Ward? Then can you explain how the Indianapolis Colts, who were hot beat the Broncos 27-24? Or how the Kansas City Chiefs, who were hot went into your crib and slapped the Broncos with a 29-13 loss? Or how more recently, how the Oakland Raiders pulled off a comeback with a 15-12 win..also obtained in your hacienda? Didn’t think you could. *NOTE* The Steelers beat two of those three teams, the only loss coming at Kansas City to the Chiefs with 3rd string quarterback, Landry Jones at the helm. Now you want to run your mouth about the Pittsburgh offense only being hot because they haven’t played Denver? Laughable bro..very laughable. Although I understand that the Broncos have not given up 30 or more points to opposing offenses all season long, they have not played a dominating, high powered offense like the Pittsburgh Steelers. A healthy Ben Roethlisberger, along with the virtually unstoppable Antonio Brown..the speedy “freak of nature” in one Martavis Bryant and the emerging play of Markus Wheaton will run circles around you, T.J.. since obviously his words tell me that he must plan on covering them all. Not to mention running back, DeAngelo Williams and tight end, Heath Miller. The list goes on and on..and I’m sure each of them have read Ward’s asinine comment. Go Steelers 27-17 Steelers, tho we dont reach 30 points a win is a win! Steelers will walk away with the win 27-17, tho we dont hit 30 points or better, a win is a win, thanks for the fuel that will feed the fire that just may push us over the 30 point mark making it 34-17. GO STEELERS!